Not feeling content with the radar-guided cruise control and lane departure warning systems on the market now? Toyota has announced a couple new pieces of tech it hopes to develop into the best way of preventing crashes without completely ruining, you know, driving. 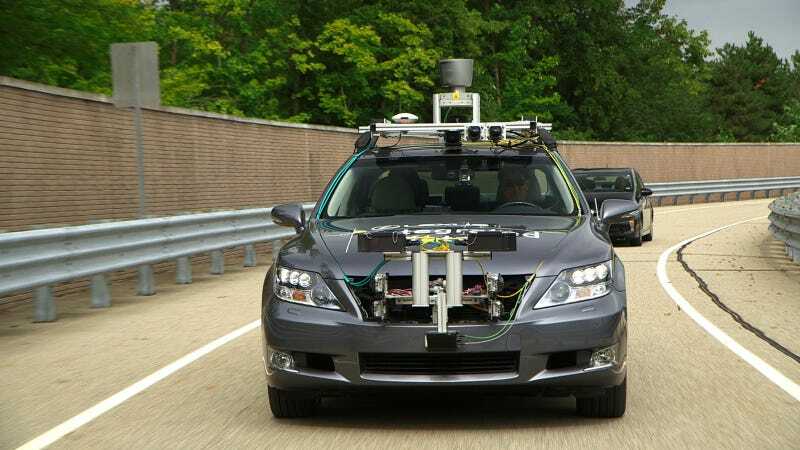 The company says its Automated Highway Driving Assist systems, comprising two advancements on familiar technology, will talk to other cars on the road so that your car won't crash into them. But it doesn't go as far as making a completely autonomous car that does all of the driving for you, meaning a human still has a role in the whole process. Toyota recognizes the importance of the driver being in ultimate control of a vehicle and is therefore aiming to introduce AHDA and other advanced driving support systems where the driver maintains control and the fun-to-drive aspect of controlling a vehicle is not compromised. Hey, this is big news! It's not every day Toyota issues a news release with those words. Anyway, AHDA uses cruise control that measures the speed of vehicles in front of you, not just your own. It incorporates that with a system of cameras and radars tracking the lane it thinks you want to be in and nudges the wheel or brakes if it thinks you're having too much fun while driving. Expect AHDA, which is not a psychiatric disorder, to show up in Toyota products in the second half of this decade. And maybe by then, there will be more fun-to-drive Toyotas to try this stuff out on.